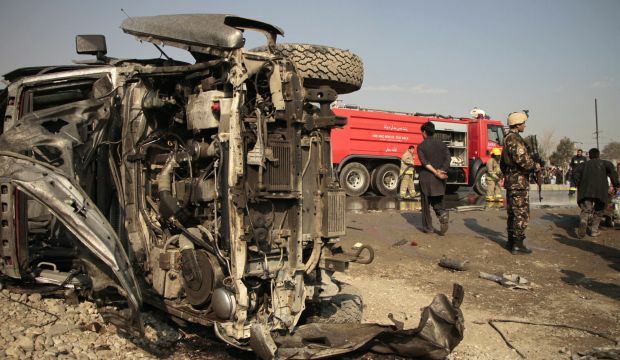 KABUL – A truck bomb exploded near an army compound in the centre of the Afghan capital on Friday killing at least eight people and wounding close to 200, police and health ministry officials said. There was no immediate claim of responsibility for the explosion, which shook the centre of the capital and ripped through homes and shops. Dozens were wounded by debris and glass shattering in the heavily populated area and cars parked at least a hundred metres were damaged by the blast, a Reuters witness said. The blast was unusually powerful in a city that is frequently targeted by the Taliban and other militants seeking to destabilise the Afghan government. Residents who witnessed the blast said they are concerned about the deterioration of security in the country. “The ground was shaking when the explosion took place. I thought it was an earthquake. It was so horrible,” said Aziz Khan, a shopkeeper. Smaller magnet bombs or suicide attacks have become a weekly occurrence in the heavily fortified capital, but large truck bombs have rarely penetrated the city’s outskirts.